As the Soviet Union fell, there were some who trumpeted the end of history. The American-democratic-capitalist model was the end towards which all human endeavors had labored: the ultimate system had been achieved. Not only were these proclamations little more than triumphal jingoism, negligent of many third world struggles, and the lessons of actual history; they also turned a blind eye to the increasing danger of economic collapse, and the eventual depletion of all resources required for a comfortably hospitable Earth. With such dangers in store for the current mighty march of progress, the case for environmentalism is stronger than ever. Not surprisingly, those appointed to bureaucratic positions to deal with these issues easily bend to the whims of financial chairmen of the current administration. Opposition to these policies forms a coherent national environmentalist movement, in which debate over tactics and approach are increasingly heated. One school of thought, known as deep ecology, advocates a return to nature and the "wild." Another, social ecology, offers the solution of societal changes which would run complimentary to ceasing nature's exploitation. Much of the arguments between the two often seem to be amount to simple knit picking, but one may explore the detailed particulars themselves with such a constructive book as Defending the Earth, a dialogue between the equally large names of Earth First! founder, deep ecologist Dave Foreman, and social ecologist magnate Murray Bookchin. Foreman’s ecological concerns stem from frustration as a Wilderness Society lobbyist, and the increasingly bureaucratized compromises he found himself making. With equally dissatisfied colleagues, he co-founded Earth First! during the 1970's. He is the author of Ecodefense: A Field Guide to Monkeywrenching, and has "been arrested six times standing in front of bulldozers, or logging trucks, or otherwise fighting giant corporations that are trying to destroy our national parks and our national forests." 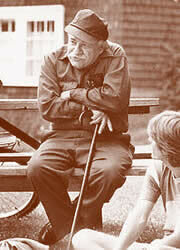 Bookchin's ideas are significantly endowed with the most constructive of anarchist politics. For over 55 years, Bookchin has been concerned with productive social movements, first as a labor organizer in the 30's and 40's, into the civil rights movements, and onto the "ecological frontlines" as early as the 50's. A prominent social theorist, he has written dozens of books, many of which require a dictionary to understand, a testament to their intricacy. Glancing over those short biographical sketches, one gets an elementary understanding of the positive and negative elements of each approach to ecology. Bookchin's thoughts and ideas are very well articulated throughout the dialogue of Defending the Earth, and his calls for "community organizing" as "a key element of radical new politics" are not only rational, but also realistic and applicable to ecological concerns. Bookchin is constantly looking to interject productive discussion and understanding into environmentalism, raising concerns over deep ecology's tendencies towards misanthropy and wild spirituality. Foreman is the one being arrested, and hounded by the FBI for his Earth First! activities. What he lacks in stimulating analysis he has made up in effective direct action; Bookchin agrees that "direct nonviolent resistance is clearly an important element... it forms a decisive step toward recovering the personal power over social life that the centralized, overbearing bureaucracies have usurped from the people." While Bookchin adequately analyzes direct action, Foreman would simply say that it gets the job done. The very reason Defending the Earth is so crucial to ecological thinking is that it more or less weds these two distinct angles by pairing them together, outlining differences and elaborating upon similarities. Though Foreman first announces, ÒI agree with everything Murray just said..." and soon after Bookchin remarks, "I couldn't agree with Dave more," this is not a simple head-nodding and self-congratulating exercise. Differences are acknowledged, some are resolved, some not, but to the betterment of both parties. Throughout, the dialogue offers considerable fodder for any individual concerned with "saving the world," as a jaded baby boomer might remark in jest. One particular example- How is it that "environmentalists" are often labeled extreme? It's a little humorous to think that those who work to promote ecological awareness and sustenance, working to maintain the little wilderness we have left are not known as "conservative," but rather that this focus insinuates a more "radical" politics. Bookchin observes that "Capitalist society, whether in Western corporate or Eastern bureaucratic forms, is fundamentally destructive. The power of this society to destroy has reached a scale unprecedented in the history of humanity- and this power is being used, systematically, to wreak havoc upon the entire world of life and its material bases." This means that nearly any "environmental" ambition, on even the most marginal of levels, is inherently working against the capitalist status quo, something one concerned with business and finances is not likely to be up for. Defending the Earth works equally well as an introductory piece to the philosophies of deep and social ecology, and an analysis and differentiation of the two. As it's now estimated that current rates of extinction have reached levels of hundreds of species a day, a focus on the environment is a societal obligation. If such ecological warning signs are not heeded and dealt with, tasks to which Bookchin and Foreman have devoted their live's work, not only will the future history of the United States be in question, but the history of the human race itself. The real "end of history."